Quote: “Though some plants have yet to grow in and a few brick paths are not quite finished, Davidson first new residence hall since 2000 is now open and home to 251 sophomores of the class of 2015. With a comfortable lounge and a separate study are on every floor, as well as a central commons equipped with a full kitchen, a computer area, and a flat screen TV, the words ‘place,’ ‘hotel’ and ‘luxury’ are frequently mentioned in any conversation regarding the New Hall, which is its functioning moniker until an official name is chosen.” James, Tom. 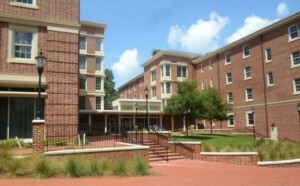 “New Hall enchances sophomore experience.” Davidsonian. 5 October 2010. Named for: Lisa and John Chidsey, both class of 1983. “The Chidseys have supported the creation of the Chidsey Center for Leadership Development among other initiatives, and John serves with dedication as the chair of the Board of Trustees.” Campus News Announcement 24 August 2015.